As time goes by, you collect more and more effects pedals. With technological advancements new stompboxes are designed almost every day, which fills your cluster with even more units. More often than not, you end up with tangled cables and a stack of pedals that create mess in your studio or during the live performances. Plus, without security, your devices might fly off the stage and ruin the whole gig for you. To avoid such detrimental turn of events, you should consider investing in a pedalboard. This bad boy will fit all your pedals on its surface and hold them in place. Some might even have power supplies that will eliminate the need of purchasing countless amount of batteries. No matter how many stompboxes you own, you need something reliable and comfortable to use, especially if you are someone who gets excited by everything that is related to organizing. This article will list down the best guitar pedalboards on the market and give you all the options possible in terms of price. If you are interested, just keep on reading and get your life (a.k.a. gear) together! 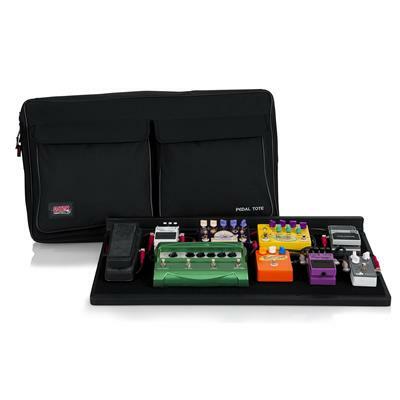 Gator G-Tour Pedalboard-LGW is something you would see in the gear of professionals. Everything about it is top-notch quality and hard to compete with. The exterior of this bad boy is built with plywood fabricated with aluminum valance. Plus, it can be easily removed to make the pedal-placing way easier. The interior is constructed using the Pro Grade Shock Absorbing EVA foam, that secures your stompboxes and makes sure nothing flies from the surface. 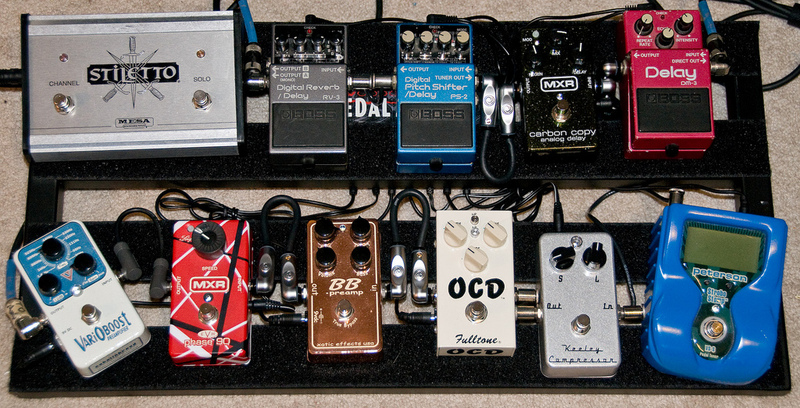 This pedalboard is big enough to fit 12 normal size pedals, including the longer ones (such as expression or wah). Instead of outdated Velcro, G-Tour employs 3M dual lock fastener, which guarantees reliable pedal-mounting. This fella has wheels and tow handle for easy transportation, which will be especially handy for touring guitarists. 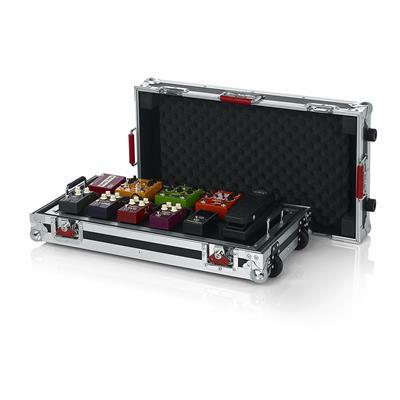 G-Tour Pedalboard-LGW has dedicated compartments for cables and power adapter. If you are looking for a reliable pedalboard, it will be hard to find anything better than this one. Boss has once again created a product that sets a high bar when it comes to quality. 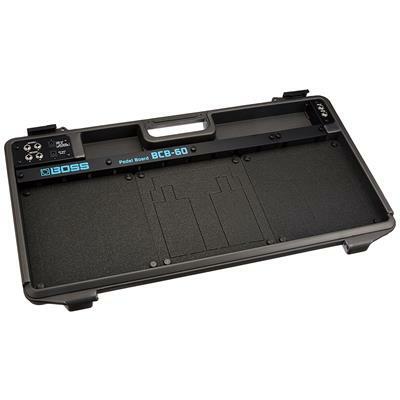 BCB-60 is a lightweight, durable pedalboard that is quite easy to carry around. Even though the exterior is built with molded resin, it can still withstand a lot of abuse. This bad boy has pre-cut foam interior that can be customized to fit any pedal, even the twin ones. This makes it really flexible and allows you to insert your stompboxes in no time. BCB-60 is medium (27×15.5×5 inches) and can fit up to 7 pedals (depending on their size). The selling point for this fella is the fact that it comes with onboard 1000mA AC Adaptor, which can power 7 units simultaneously. Plus, it has all the additional cables, including 3x pre-cut insert, 1x spare insert, 8-pin parallel DC cord, 5x short L-L cable and 3x long L-L cable. BCB-60 is definitely one of the best power pedalboards that will easily stand the test of time. As the time goes by, BEHRINGER is creating more and more amazing products. PB1000 is definitely one of those. It is constructed with heavy-impact plastic that can withstand frequent gigging and abuse (you might not want to bit it though). The interior has foam, that can be customized according to your devices. This fella can fit 12 pedals (both regular and micro) and hold them securely during the performance. The best part is, it comes with onboard 1.7A power supply so that you can forget about the batteries. Plus, all the cables that you will need are also included in the package, including 1×12 daisy chain cord. PB1000 has ¼” inputs and outputs for your stereo pedals. It is quite large, measuring 4.5×26.1×19.8 inches. The casing is not heavy and can be carried around easily. All in all, this pedalboard has more space than you will ever need and provides you with decent support at an affordable price. Pedaltrain Classic 2 is an update from the previous PT-2. Even though there are not too many differences between the two, the latest version is way more flexible than its predecessor. It features the classic rail design and is constructed with hand welded aircraft-grade aluminum. This bad boy can fit any pedal of any size, which makes it really flexible for current gigging. 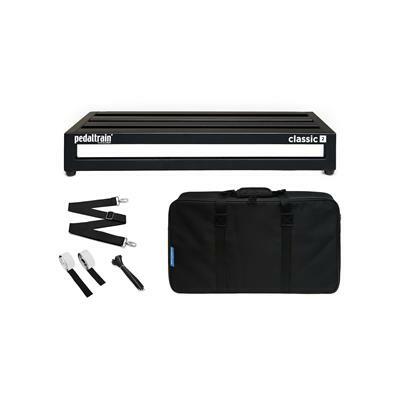 Classic 2 comes with soft casing with shoulder strap (very easy to carry around), 96 inches of Pedaltrain’s professional grade adhesive backed hook-and-loop for securing your stompboxes and a bunch of zip ties. This fella has 8° incline, which means you can place even the biggest power supply underneath. Classic 2 measures 24×12.5×3.5 inches and is more than enough for any guitar player. All short, this pedalboard is extremely durable and will be by your side for a long time. What we have here is yet another quality product from Gator Cases. GPT-PRO is an unpowered pedalboard that can easily pack 10 stompboxes (or more if needed). It measures 30 x 16.5 x 2.5 inches and will be more than enough for any guitarist. It is constructed with plywood material that is covered with rugged Tolex. This fella has two sections for mounting power supplies underneath. It has enough height and incline to fit Gator G-Bus like adapters. All the cables can be routed underneath, which makes the organizing process even smoother. GPT-PRO has a Velcro surface and comes with additional Velcro in order to set up your pedals securely. The package includes soft carrying bag (with removable shoulder strap), which has two huge pockets for storing all your cables and other accessories. In brief, this pedalboard can withstand even the heavy abuse and provides enough space to fit all the pedals in your storage. Are you on a budget and looking for something convenient? 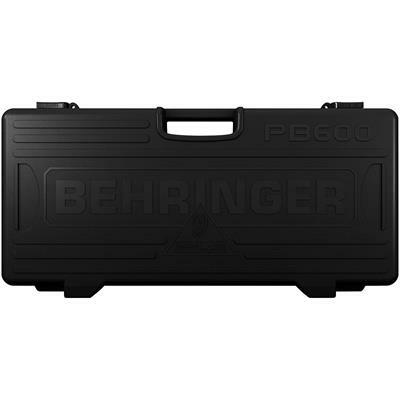 Then BEHRINGER PB600 can be what you need. This fella is made from plastic, but is still quite safe and sturdy to keep your pedals away from harm. With the size of 4.5 x 26.1 x 12.9 inches and 8.4 pounds weight it can hold six 2.5 x 4 inch pedals. PB600 is suitable for any stompbox that matches standards, so it is quite convenient. What is more, BEHRINGER has included very good hardware while creating PB600. All the input and output jacks are placed nicely and it will not create a mess while using. It also has 1.7 adapter, that can be used for more than 6 pedals. This means that PB600 avoids overloading which makes it reliable for on-stage utilization. Finally, this pedalboard has all cables that you need to set your stompboxes and be ready to play. Shortly, PB600 is an affordable and versatile pedalboard with modern design. SKB PS 8 offers you very good durability and it comes with heavy-duty nylon bag. Pedalboard itself is very lightweight (5.15 pounds) and easy to use. Dimensions are 21.38” x 15.38″ x 2″ and can fit 8 standard sized pedals. You know what this means? Well, the answer is simple: with this pedalboard you can carry all the necessary effects that you need for the gig or other events. As I have already mentioned, SKB PS8 comes with nylon bag, which has zipper pocket and shoulder strap, so using it will be extremely convenient. Let’s talk about another important part of the board – the hardware. Pedalboard is equipped with enough cables to connect 8 stompboxes, it also has built-in power ports and a 500mA power supply. Shortly, if you want a pedalboard with comfortable design and affordable price this may be your one true love. If you are a beginner and just started to experiment with fewer pedals, or work far from home and want to have all essentials with you, Metro 16 is perfect fit. The design of the pedal is quite unique and extraordinary. It has a smaller size – 16″ x 8″ x 1.4″, but is constructed from aluminum which makes it extremely durable. Metro 16 weighs only 1.4lbs (0.725kg) and is very easy to carry around. With open side of the board you can easily connect wires to your pedals, without getting them tangled. Plus, with hook and loop material, it can hold your stompboxes very nicely. 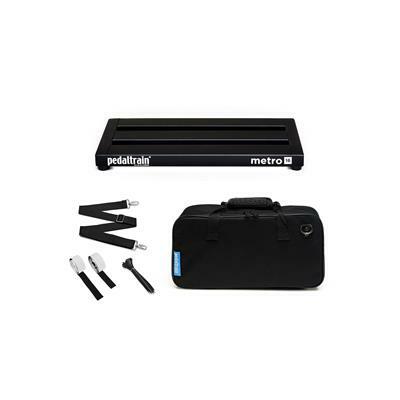 In addition to this, Metro 16 comes with waterproof soft case, which has a shoulder strap and self-sealing zippers. This fella is very convenient, lightweight and affordable for all those budget players out there. You know what to expect when you see the name Donner. The quality of their products is getting better day by day. DB-2 falls into the same category. It is quite similar to the previous models, but I think you can still learn some interesting information about this one. With 20 x 8 x 1.2 inches of surface, DB 2 can fit 12 stompboxes or any other pedals of different sizes. You can securely anchor your pedals to the board and dive into the music. It has aluminum construction and is extremely durable. 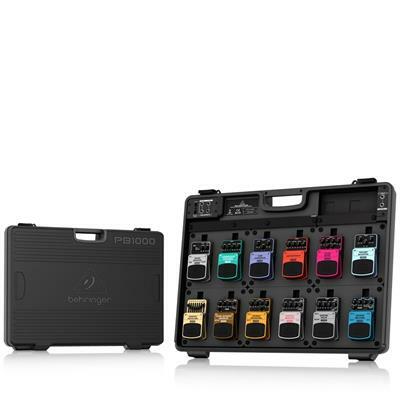 The selling point of this product is that it can be utilized by both beginners and professionals with everything they will need on hand. It does not include the power system, but the design allows you to connect all the wires easily. Plus, DB 2 comes with durable and comfortable bag. If you are in a rush, you can just unzip the bag and connect pedals to the power, without taking the pedalboard out of the case. To sum up, this is the best pedalboard for the price. What we have here is yet another affordable option. 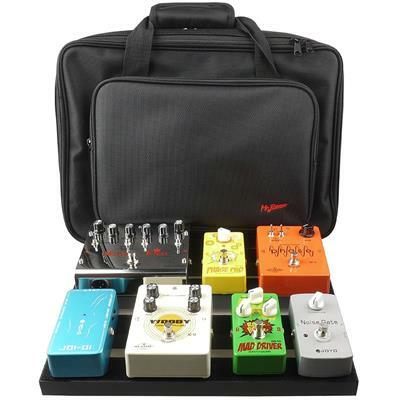 Mr. Power Pedalboard is extremely cheap, but offers quite a decent quality for the price. It is made with aluminum alloy that promises to withstand years of usage. It has a train design which makes cable routing quite easy. Mr. Power Pedalboard comes with all the Velcro and accessories you would need for setting up your stompboxes. 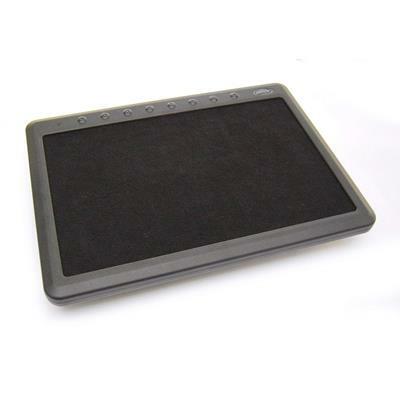 It has a small size (15.7×7.1 inches), enough to fit four pedals with good amount of spaces in-between. This bad boy comes with a durable bag that makes it easier to carry around. The case is big enough to fit the board with the pedals mounted on top. 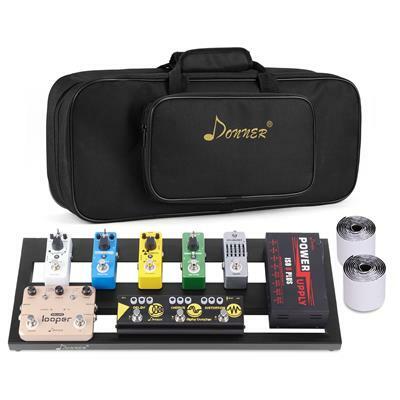 In brief, Mr. Power pedalboard is a great option if you want something compact and easy to use without breaking the bank. Why would you need a pedalboard? The answer to this question is quite simple: if you do not want your life to be a huge pile of stompboxes, you need to purchase a pedalboard. This small piece of equipment allows you to organize everything beautifully and gives you all the control you will need. It holds your pedals in place and makes sure that nothing is lost during performance or transportation. It just makes everything nicer and easier to use. I do not think you can say no to this. Another important thing I have to mention is the placement. When using several effects at once, nothing is more important than the order of the pedals. This is where a pedalboard comes into play. It allows you to assemble your stompboxes in proper manner (more on that later) and keep them that way all the time. This will be particularly handy for those who are always on the road and have frequent gigs. In short, you need a pedalboard in your life if you are not into anarchy and disorder. What to look for when searching for the best pedalboard? We all have different needs and requirements when it comes to choosing a piece of equipment. Due to this reason, it is hard to dictate what you should consider when buying the pedalboard. However, there are certain things we all expect from our gear. Let’s discuss some basic standards even the simplest pedalboard should satisfy and figure out what are the most important factors that contribute to the decision making process. This is probably the most subjective issue, but it is still possible to come up with certain rules that define affordability. No matter how much money you own and are willing to spend on a single piece of equipment, there is one simple thing: something around 50-70 bucks would be relatively cheap for anybody. Now that we have this issue out of the way, let’s discuss the features that determine the price of the pedalboard (most of them will be discussed in-depth below). Build material, the size and powering options are the basic factors that define how much this piece of equipment will cost. You can find a decent pedalboard at any price range, it all depends on your needs and preferences. It is true though, that higher-end options will have sturdier body, better design and high-grade power supply. If you are a touring musician, travel a lot and have frequent gigs, you will definitely need something that is built like a tank. In this case, you should go for aluminum, plywood or hard plastic material. This way you will have a reliable pedalboard on hand and will not have to worry about it disassembling during the performance. However, if you need something for home or studio utilization, you can be less meticulous about the build quality. The main thing is to purchase a pedalboard that will hold at least 5 stompboxes without breaking and you will be good to go. One way or another, durability is something you should always consider when scavenging for any piece of equipment. This is the case where size matters and it matters a lot. Typically, pedalboards can fit 4 to 12 stompboxes. It depends on what you are going for. If you want all your effects unit to be mounted in one place, then you will probably need a larger size. However, if you own only 5 pedals, there is no need to splurge on a vast pedalboard that will take up the space unnecessarily. Luckily, there are a lot of options on the market that will satisfy even the pickiest customer. But remember, the smaller the pedal, the lower the price. Now, there are two basic types of pedalboards on the market: powered and unpowered ones. The former means that the board has some sort of power source that will supply all the pedals. The latter does not have this feature. In this case, you have to purchase an adapter separately and fit it either underneath the equipment or set it by the side. The drawback of powered pedalboard is that some cheaper models come with cables and power supply that have poor quality. This might create the issues such as overloading, unpleasant noise or even unexpected failure of the pedals. What is more, some stompboxes have specific power requirements that powered pedalboards might not be able to adjust to. If that happens, you will have to purchase power related accessories yourself, which ultimately means that you will have to spend more money (and you might as well buy an unpowered pedalboard). One more thing to consider is that not all power supplies are the same. They all have various capacities, ways of setup and adaptability. You have to choose an adapter depending on the size of your pedalboard. You cannot expect from a 500mA source to feed 12 stompboxes. You should also take into account the length of the cables and the compatibility of your pedals with the power supply. These are small details that have huge impact on the final results. It is always better to be cautious from the beginning and purchase the pedalboard that will not disappoint rather than spend twice the money and go through a lot of frustration. One of the core reasons why you would consider purchasing a pedalboard is to make everything easier, right? It would be nonsensical to spend hours on setup every time you will employ the effects. That is why it is only natural to look for something that offers simplicity. The majority of the pedalboards come with handy adhesives, paddings or Velcro that can be adjusted in seconds. This also defines the flexibility of the said gear. If you can insert and remove your pedals without having to take apart the whole thing, you will have the ability to swap between the devices whenever needed. Last but not least, when searching for the pedalboard, it is quite important to consider accessibility. What I mean is that you should have some space between your pedals. This largely depends on how you spread everything out, however, there are models that have pre-cut positions that cannot be customized. In that case, you should see if the pedalboard is big enough to maintain that essential space. If not, you might have the issue of stepping on the wrong unit mid-gig and messing up the whole performance. The features I have discussed above might seem a bit overwhelming and hard to keep track of. But trust me, if you analyze them deeply, they will pop-up every time you enter the market of pedalboards. Being meticulous about your gear is what will give you the best results. Even though boards are not directly connected to the sound you create, they incidentally affect your overall performance. Don’t you dare to underestimate them! How to set up the pedalboard? When it comes to setting up your pedalboard, there are no clear-cut rules that dictate how things should be. There are just simple suggestions based on past experiences that will give you an idea of how effects work. You are free to place your pedals in any order, because, hey, none of us has the right to interfere with your music. The following setup is a simple representation of the order that is commonly used among various musicians. And that is it. You are welcome to ignore everything I am about to say. The setup of this ilk works because it takes into consideration the specifics of each pedal. For instance, drive pedals work best when they are fed with clean signal, wahs are thickened and attenuated when paired with distortion, EQs (they can be placed anywhere to be honest) shape the affected sound beautifully, modulation effects are richer and more unique when they are added to distortion and wah, while time-based effects sound way more natural when placed at the end of the chain. It is as simple as that. There are numerous variations to this setup and I am sure they all work perfectly. The main thing is to make sure that the sonic qualities of your signal are not lost in the chain. Go on, set up your pedalboard as your heart desires and rock the world of effects like a real pro. This concludes our venture in the world of the best guitar pedalboards. We have been through numerous experiences together, but the most exciting ones are yet to come. There was time in my life when I could not have cared less about keeping my gear in order. I would just grab what I needed and start playing. As I grew older, I became more responsible and started considering my sound more seriously. In the process I kept on buying various effects pedals and experimenting with them. That is when I first felt the need to invest in a pedalboard and commence organizing my stompboxes. You probably will not believe me if I say that it changed my life. But it really did. As I saw my setup all figured out, I was more motivated to practice and discover new things. You never know where you will find the inspiration. I dare you to purchase the chosen pedalboard right away and implement it in your rig. Let me know if it turns your world upside down. Until then, I will have to say goodbye to you. Good luck!